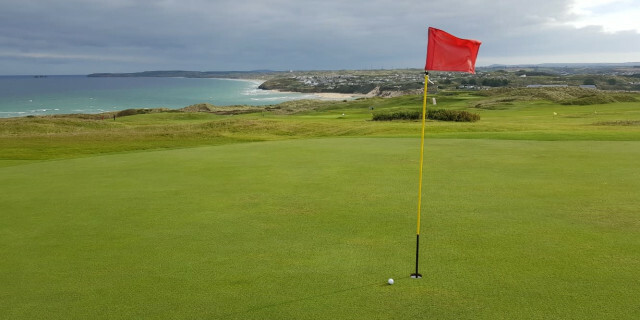 Sat overlooking the picturesque bay at St Ives, West Cornwall Golf Club is a fine links that dates back to 1889. The golf course also borders the historic village of Lelant whose ancient church just off the back of the 1st green. The original pavilion still stands and is now used by the club's ladies, and you will also catch sight of the old Victorian railway that runs along the cliff next to some holes on its way through to St Ives itself. 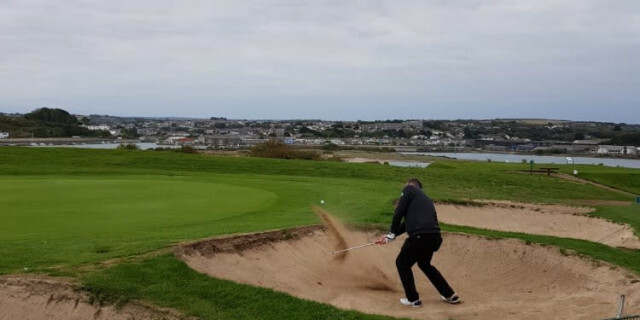 The inaugural winner of the USPGA Championship, Long Jim Barnes first learned to play at West Cornwall Golf Club and he would have done so on true undulating links land. At just under 6,000 yards, the course provides a stern test that is full of hummocks hillocks and hollows. Deep pot bunkers and run off areas will also keep members and visitors on their toes. We received a fantastic reception in the pro shop from Ian. He was extremely welcoming and full of local and historic knowledge. He also pointed us in the direction of the practice range, putting green, chipping area and practice bunker. Once he directed us towards the first tee - with the aforementioned church in sight - we set off full of excitement. 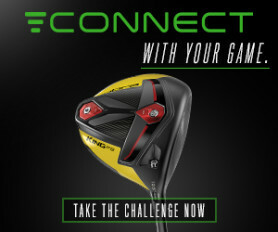 The front nine felt the 'quirkier' of the two given its compact tight nature. A demanding 170 yard par 3 gets you on the way, where due to the undulations, a tee shot that lands on the green will still do well to stay there. A demanding approach shot to a raised but narrow green on the par 4 2nd is swiftly followed up by the tactical and challenging third. The 4th has out of bound right where the church sits, but given the lay of the land your tee shot will more than likely head down to the left where this fairway meets that of the 8th. The approach into the 4th will also be blind with four pot bunkers at the back of the green to capture anything that goes long. 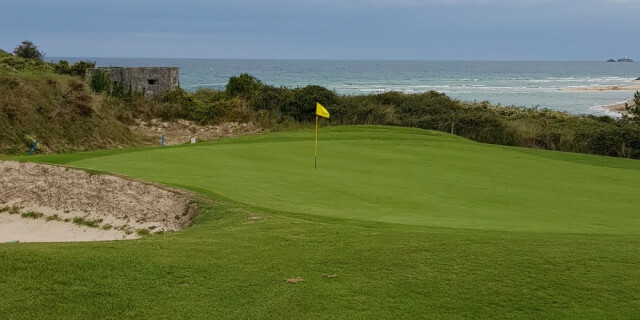 The 9th ends the front brilliantly, as you start to get your first real views of the sea at St Ives Bay, whilst fairly forgiving off the tee, your approach up the hill to the raised green is not for the faint hearted! Another blind tee shots gets you up and running on the back nine. Although the 10th is a modest 328 yards, the pin position may get you thinking twice about your club choice. The 11th has a great approach shot into the green where the fairway drops away about 80 yards short of the green meaning club choice from the tee is critical to making a score. The 12th is a spectacular long par 5 from a raised tee giving the perfect photo opportunity of the bay and the town in the distance. Big hitters can definitely get on in two here. The 14th is probably the toughest hole on the back as a dog-leg left to right you have to work out how much of the corner to take off to leave you a good second shot in, this is quickly followed by a short - but not to be underestimated - par 3 which is protected by 11 (Eleven!) pot bunkers. The 16th is a long tough par 5 up the hill, followed by another challanging par 3. The 18th is a fitting finishing hole, again teeing off from another fantastic vantage point, the fairway runs all the way down to the green giving you a great opportunity to finish with a birdie! You really get the sense that West Cornwall has been around for as long as it has. The natural grounds and surroundings offer so much fun and a true test of golf for the ages. The course was in fantastic condition given the hot summer we have had. The greens were as quick as they should be given the natural defense the course has with the bunkers and run off areas. It is a tough course, however one that I think golfers of all abilities should and will enjoy regardless of the score. I was concerned about the number of blind tee shots, but it does need mentioning that all of these holes are very well marked and visible from the tee - in some cases the hole number was at the top of the markers. 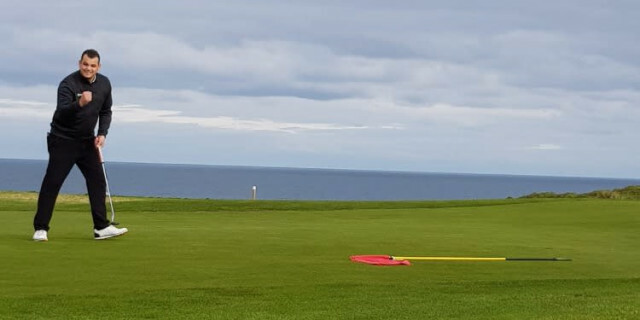 Overall West Cornwall Golf Club is a true historic golfing treat that should be enjoyed if you are ever staying or visiting locally!